We are quite used to the heat by living in Singapore, but we are quite struggling here in Europe and trying to stay cool in the hottest week of the year (that’s how the experts call it). Dips are a great way to eat fresh vegetables, so here is one, inspired by Donna Hay. This creamy dip is perfect served with cucumbers, carrots and peppers but also a great spread on some fresh bread or focaccia! 2. Peel and cut the sweet potatoes roughly. 3. Chop the onion roughly. 4. Line an oven tray with baking paper and put the potatoes and onions over it. Season with salt and pepper and the olive oil. Toss to combine. Bake for 30 Minutes or until cooked. 5. Drain the chickpeas from the water. Take 1/3 and place them on a small baking tray. Season with chilli flakes, salt, pepper and 1 tbs of olive oil. Toss to combine and cook for 10-12 minutes until crisp and golden. (You can put them in the oven while the potatoes are cooking). 6. 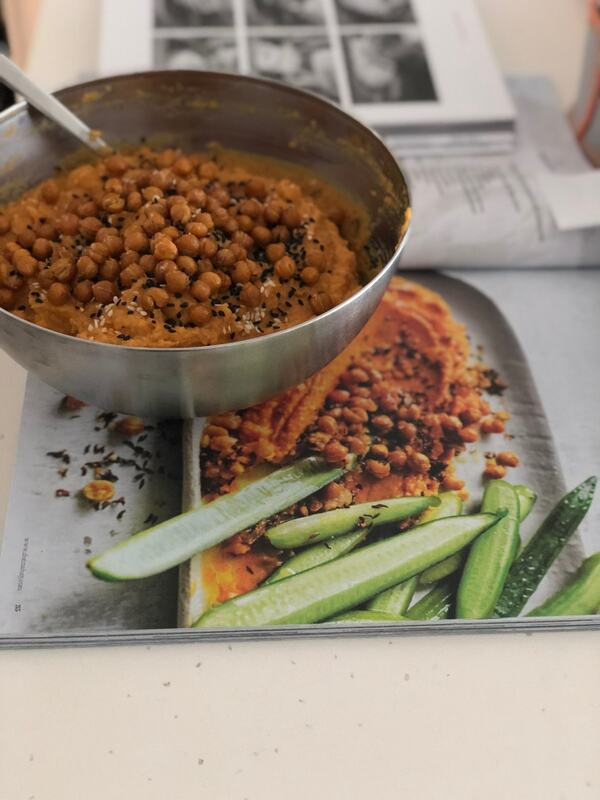 Place the other chickpeas in a food processor, add the cooked sweet potatoes (let them rest for a bit, so you won’t ruin the processor), onions, turmeric (1tsp), lemon juice (1tbs), salt and pepper and water (start with 80 ml and add more if it’s necessary). Process until smooth. 7. Transfer in a nice bowl and top it with the crispy chickpeas. 8. Enjoy with vegetables and/or bread! 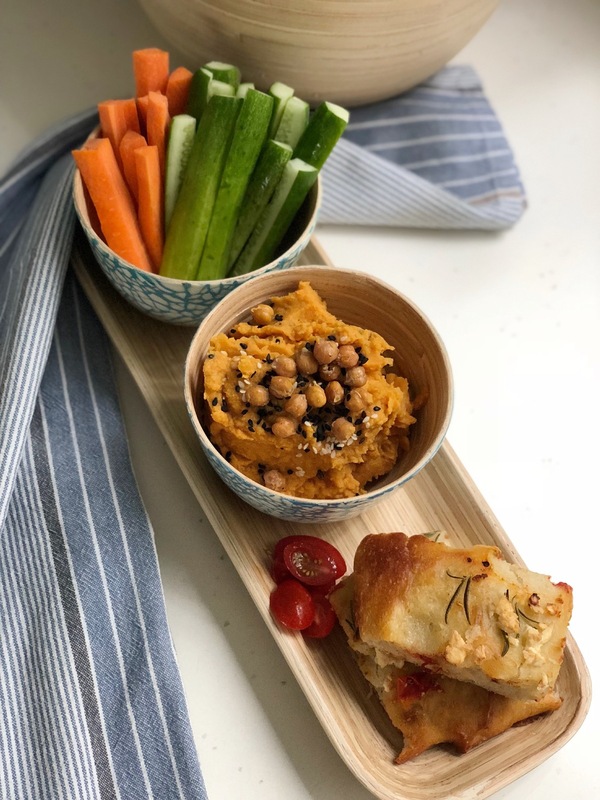 The crispy chickpeas are also amazing as a snack by themselves! So I suggest you bake more and use them as a yummy and healthy TV-snack! Pair the hummus with my homemade bagels! Here is the recipe again, for you to save and/or print out! Peel and cut the sweet potatoes roughly. Line an oven tray with baking paper and put the potatoes and onions over it. Season with salt and pepper and the olive oil. Toss to combine. Bake for 30 Minutes or until cooked. Drain the chickpeas from the water. Take 1/3 and place them on a small baking tray. Season with chilli flakes, salt, pepper and 1 tbs of olive oil. Toss to combine and cook for 10-12 minutes until crisp and golden. (You can put them in the oven while the potatoes are cooking). 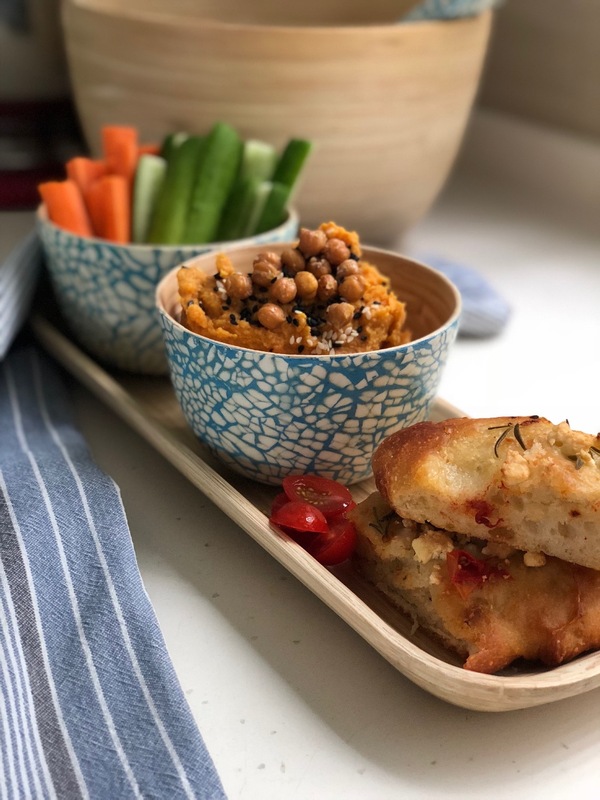 Place the other chickpeas in a food processor, add the cooked sweet potatoes (let them rest for a bit, so you won’t ruin the processor), onions, turmeric (1tsp), lemon juice (1tbs), salt and pepper and water (start with 80 ml and add more if it’s necessary). Process until smooth. Transfer in a nice bowl and top it with the crispy chickpeas. Enjoy with vegetables and/or bread!